The Pilot Sport A/S 3+ is MICHELIN'S ultimate Ultra High Performance All-Season tire combining summer levels of wet and dry grip with cold weather and snow mobility*. 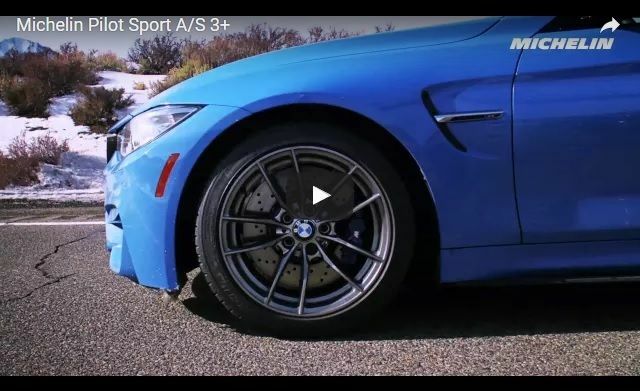 Delivering more dry grip than a leading competitive max performance summer tire, the shortest wet and dry braking of leading competitive tires in the UHP A/S category, and 28% better snow traction than the MICHELIN Pilot Sport A/S 3. With such claims, could this enhanced UHP A/S tire by MICHELIN be a game changer? We were recently invited by MICHELIN to spend a thrilling day testing their revised UHP A/S tire. The first portion of our testing consisted of everyday road handling/comfort through the roads of Nevada. Our second portion was performance geared. At Spring Mountain Motorsports Ranch we pushed the tire to the limits through a dry/wet braking course and dry/wet autocross course. The on-road portion of our testing was filled with the perfect amount of spirited driving miles and scenic views. We made our way from Las Vegas, to Hoover Dam, and then through Red Rock Canyon piloting Audi S4, Lexus IS350, and BMW M4 vehicles. The Pilot Sport A/S 3+ rode smooth and was responsive to steering input. Albeit a bit of road noise was present, which could be contributed to the lower profile tire sizes, the Pilot Sport A/S 3+ was a pleasure and overall very comfortable to drive. The on track wrap-up of our testing is where MICHELIN backed up their claims against the competitors tire set. Through the dry/wet autocross course the Pilot Sport A/S 3+ exhibited less understeer, which was particularly noticeable in the dry, and proved more responsive when compared to the competitors tires. For the dry/wet braking section, we ran the vehicles up to 60 MPH and stood on the brake pedal, simulating an ABS panic stop. Using data loggers for confirmation, the Pilot Sport A/S 3+ displayed the shortest stopping distances, averaging 125 feet in the dry and 142 feet in the wet for our group. These distances beat out the competitor tires by 2-3 feet on average, which at a quick glace may not seem like a lot but, those few extra feet could be the difference between paying a deductible for a car accident or not. Our take away... MICHELIN has successfully maintained it's class leading dry and wet performance known among enthusiasts with the original Pilot Sport A/S 3 in the new A/S 3+ version. The difference, MICHELIN has found the right recipe that blends performance handling and grip with improved winter performance, delivering a truly well balanced tire featuring a 45,000-mile limited warranty. But wait, you mentioned winter performance? I know, I know... we didn't test the tire in winter conditions. Unfortunately, we were unable to do so. However, through independent third party testing MICHELIN states their Pilot Sport A/S 3+ delivers 28% better snow traction than the original Pilot Sport A/S 3. So is it game changer? Time will be the determining factor. My gut instinct tells me the Pilot Sport A/S 3+ will be on par, if not better, than most other class leading tire models when it comes to winter performance. I can't wait to read real world first hand reviews. VARIABLE CONTACT PATCH 3.0 originally developed for endurance racing, distributes forces and temperatures evenly over the contact patch thanks to the latest digital simulation software used in the aeronautics and automobile industry. It is combined with an aggressive asymmetric tread pattern inspired by the MICHELIN Pilot Super Sport. EXTREME AMOUNTS OF SILICA in the tread compound (derived from wet endurance race tire technology used to win the 24 Hours of Le Mans) combined with variable thickness sipes and large circumferential grooves result in incredible wet grip and resistance to hydroplaning in deep water. HELIO+ COMPOUND™ combined with unique biting edges in the tread grooves that grab loose snow to help acceleration and braking in winter conditions result in confident mobility in cold and snowy conditions. MICHELIN PROMISE PLAN comes standard with all MICHELIN tire purchases and includes a 30-Day Satisfaction Guarantee, 3-Year Flat Tire Changing Assistance, and Plan Limited Mileage Warranty. Right now during our Presidents' Day Deals event you can save $100.00 back by mail with the purchase of a set of four(4) Michelin Pilot Sport A/S 3+ tires. Purchase with Discount Tire credit and save an additional $60.00 by mail, for a combined savings of $160.00!